Murilla Shire, an area of 6074 sq km, on the western Darling Downs, was amalgamated in 2008 with Dalby Town, three other shires and part of Tiaro Shire to form Dalby Regional Council. Its administrative centre was Miles, 300 km north-west of Brisbane. Miles lies on the Warrego Highway and the Western railway line to Charleville. The shire was named after a pastoral run (1870s) on the east side of the Murilla Creek, and the name was reputedly derived from an Aboriginal word describing a pile of stones. 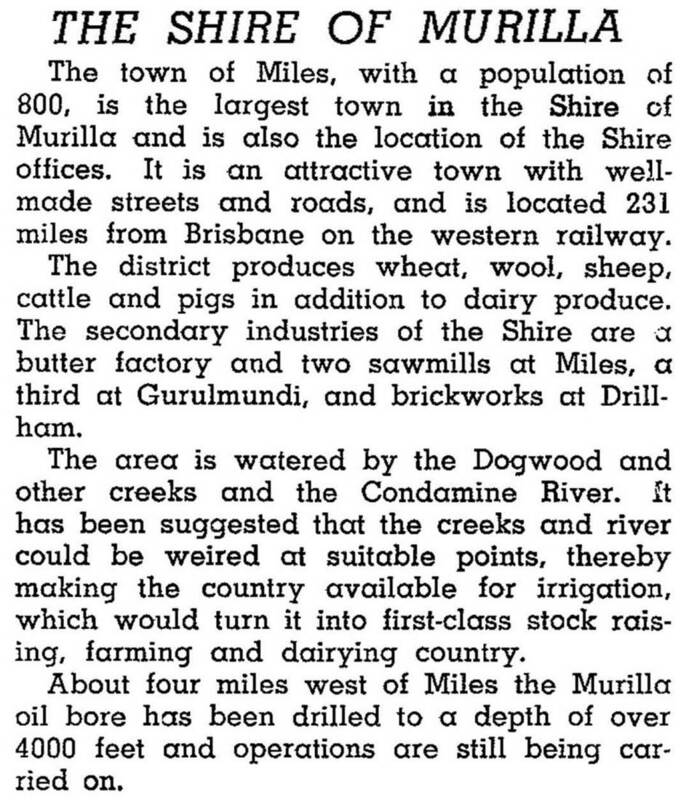 The Murilla local government division was created in 1880, meeting at Condamine (south of Miles), but by the time Murilla became a Shire in 1903 the offices had been moved to Miles. The Shire was well positioned for access to metropolitan markets for its wool and cattle, but by the 1910s there was increasing prickly pear growth west of Miles. A prickly pear experimental station was located at Dulacca in the heart of the infestation. Elimination of the pest was achieved by the 1930s, but it was the early 1950s when significant prosperity came with the boom in wool prices. A new civic centre was opened in Miles in 1961. Grain production diversified into sorghum and barley, and cattle are both grass and grain fed. Irrigation water is drawn from the Gil Weir on the Condamine (1949) and the Dogwood Weir (1980) supplements town water. The Shire has provided two housing estates and an industrial estate in Miles. Despite the sparsity of strong tourist attractions the Shire has promoted its fishing, natural flora and the Miles historical village. Agriculture, however, was the leading employment sector in the Shire (37% of total employment, 2001). It was followed by retail distribution (11%), health and community services (8%), construction and education (7% each). In 1994 Murilla Shire had nearly 70,000 beef cattle, 31,000 sheep and lambs, 3200 pigs, 56,500 ha under cereals and 17,600 ha under hay and green fodder. * After severances for Bendemere and Tara Shires.